The following important documentation from one of the original documents submitted from a 1991 meeting which outlines the Muslim Brotherhood's strategic goals for North America. The document was entered as evidence in the 2008 Holyland Terror Funding Trial. Federal investigators found the document in the home of Ismael Elbarasse, a founder of the Dar Al-Hijrah mosque in Falls Church, Virginia, during a 2004 search. Elbarasse was a member of the Palestine Committee, which the Muslim Brotherhood had created to support Hamas in the United States. Since the original document is in Arabic we have listed pages of which the English translation shows the importance of the document. "...the Movement must plan and struggle to obtain "the keys" and the tools of this process in carry out this grand mission as a 'Civilization Jihadist' responsibility." “A list of our organizations and the organizations of our friends” - This is where the Muslim Brotherhood listed its front groups in the U.S.. Note that prominent organizations like CAIR, ISNA, ICNA and others are named in the document below. 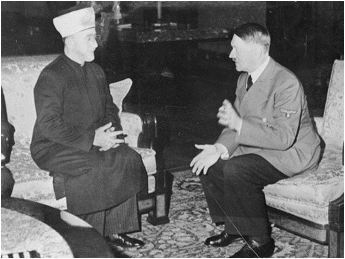 Muslim Brotherhood was founded in Egypt in 1928 by a 22-year old Muslim named Hassan al-Banna, who admired Adolf Hitler's hatred of the Jews and persistently wrote to Hitler to express his admiration for Hitler, as well as his desire for collaboration with Hitler's Nazi Party. 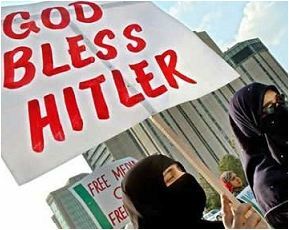 During World War II, members of the Muslim Brotherhood spied for Hitler's Nazis in the Middle East and fought for Hitler as Nazi troops in two specially formed Muslim Waffen-SS Handschar Divisions ('Handschar' is German for scimitar, the curved saber used by the Muslim troops of the Ottoman empire). 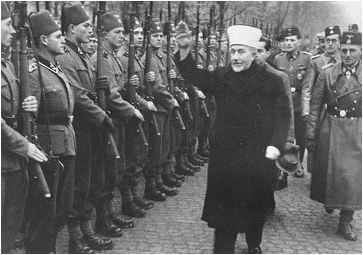 Haj Amin al-Husseini, the Grand Mufti of Jerusalem and a close ally of al-Banna, in Berlin, where he lived as Hitler's VIP guest from 1941 to 1945, before joining al-Banna in Egypt in 1946. The Muslim Nazi troops of the Waffen-SS Handschar Divisions are being reviewed by Haj Amin al-Husseini (left 2nd pic) and by the SS Reichsfuhrer Heinrich Himmler (3rd picture). 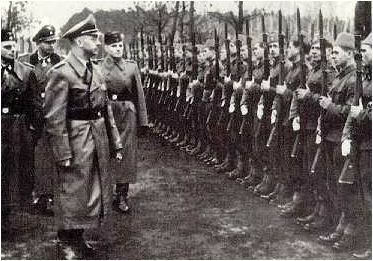 Due to the large number of Muslim volunteers, the HandscharDivisions were the largest of Hitler's 38 Waffen-SS divisions. After World War II, the Muslim Brotherhood continued to grow, supported this time by the West, which saw it as a counterweight to the threat of Soviet-backed communism in the Middle East. By the late 1940s, Muslim Brotherhood numbered 500,000 members. While some of them built schools and medical clinics, other continued to engage in violence, including bombings, arsons and murders. In 1948, members of the Muslim Brotherhood assassinated the Egyptian Prime Minister Mahmoud Fahmi al-Nuqrashi and participated in the invasion of the newly re-created nation of Israel. The Muslim Brotherhood's violent conflict with the Egyptian government, which also included the government's assassination of al-Hanna and two failed Muslim Brotherhood assassination attempts on the Egyptian President Gamal Abdel Nasser, eventually led to many of its leaders being jailed while others fled and established branches abroad, mostly in the other Middle Eastern Arab nations but also inEurope, UK and USA. Concluding that it did not yet have the muscle to spread Islam by force, Muslim Brotherhood 'officially' renounced violence in the 1970s, and switched to more cunning strategies detailed in its secret internal manifesto: "The Project". In 1979, Western powers supported the Muslim Brotherhood to form the Mujahedeen army and fight the Soviet army in Afghanistan. 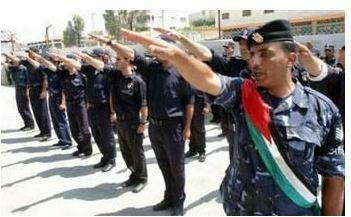 In 1987, Muslim Brotherhood in Israel created Hamas, whose members still use the Nazi salute (above) and read Hitler's Mein Kampf, which the Muslim Brotherhood titled, My Jihad,and translated into Arabic in the 1930s (Mein Kampf remains the #6 best-seller today in the Muslim world and a favorite among the members of Muslim Brotherhood). In 1989, the Muslim Brotherhood's Mujahedeen army pushed the Soviet army out of Afghanistan and then split. One of the factions became Al Qaeda, led by a Muslim Brotherhood-schooled Saudi named Osama bin Laden.